I’m blaming the supermoon for my lapse in judgement. But let me tell you it was so worth it! Best rice pudding I’ve had in a while. And whipped cream is my favorite food group. I saw lots of friends and they all were so confused to see me without my doodle sidekick. There was a “dog wash” where you could get your dog squeaky clean for a small donation, pet store and pet care vendors with free samples and goodies, an animal rescue organization with some of their available pups (be glad I didn’t take pictures because your heart would have melted and you would have wanted to travel from wherever you are to come adopt one.) It was quite the turnout and with the 50/50 and themed basket raffle combined with the sale of some other items the dog park organization raised lots of money to go toward the maintenance of the dog park. Success! Finally I looked at my watch and realized I needed to hightail it out of there to get back to the groomer where Duncan was ready for pickup. Got in my car. It didn’t start on the first try or the second. I freaked for a second. I just replaced the battery. Hmm….maybe the alternator? Nah. It’s gotta start. So I tried again and this time it turned over. Whew! I made it not a mile up the road when all of a sudden the check engine light came on, the RPM tachometer needle literally started going haywire from 0 to 7 over and over. I tried to make a quick right and pull onto a side street but the car died and power steering locked. Next thing I knew I was coasting right toward the curb where the street sign pole was. I quickly threw the car in park and put my hazards on. Called my friend Nicole who was still working at the event with her husband (she’s the owner of the pet care company I use for Duncan) She sent him to come help me out. We got the car started and he said he’d follow me the 3 miles home. So off we went about one more mile and then the same thing happened but this time we were now on the highway! So I coasted over to the shoulder. There was white smoke coming out of the muffler and it smelled like a combination of gasoline and exhaust fumes. We tried to start the car again and hoped we could get a little farther since I was only 2 miles from home now. No good. This time it wouldn’t start again. That’s when I realized Duncan still needed to get picked up at the groomer. So I gave Bobby my house key, Duncan’s leash and cash to pay the groomer and he left to go get Duncan and bring him to my house while I called up GEICO emergency roadside assistance. I get a free tow but since I was on a restricted access highway I had to pay and I’ll get reimbursed. About 45 minutes later my knight in shining armor a fluorescent yellow t-shirt arrived. In all the years I’ve been driving (close to 25 years) this is the first time I’ve ever needed to be towed. So I shouldn’t complain =) We got my girl to the mechanic but they were closing so it’s now parked there until Monday when they return. I didn’t know if I wanted to ask anyone else for a favor so I started to walk home. It was hot and almost 4pm already and I knew a 3 mile walk would take me an hour. So I caved and called another friend who scooped me up and brought me home. I was now stuck in the house and thirsty and needed to decompress from the ordeal (yeah, don’t ever let me sign up to be on Survivor) so I decided to make an adult beverage. I had frozen mango and pineapple in the freezer and two types of rum, perfect for a summer cocktail! Once I was finally relaxed and over the whole breakdown thing I decided to research a little bit more about my ankle tendonitis. It’s been starting to get a little achier and while I know it’s because I’ve started running again I just had a feeling my nagging tight and sore calf muscle was related. Sure enough it turns out that there is a trigger point which I vaguely remember from when I had acupuncture that causes referred pain to the outside of the ankle right where my discomfort is. While I’ve been using a tennis ball to massage the back part of my calf I haven’t been digging in to the trigger point area to get a good release. Now I’m on to something! I spent about 30 minutes tonight working on it and I can’t believe the almost immediate relief I felt. The human body never ceases to amaze me. Duncan wasn’t exactly thrilled that I was using his tennis ball and rope toy for stretching and trigger-point massage. He wasn’t too thrilled that he got a haircut and bath either. Meanwhile I was feeling sad when I realized without a car I wouldn’t be able to drive to Brooklyn to run with some of my peeps. But tonight I got a text that said they’d come to me!!!! WOO HOO!!! So I’m off to go map out a 10 mile route for us. So tell me your breakdown stories. Also, if you’ve recently bought are leased a car tell me what you got. 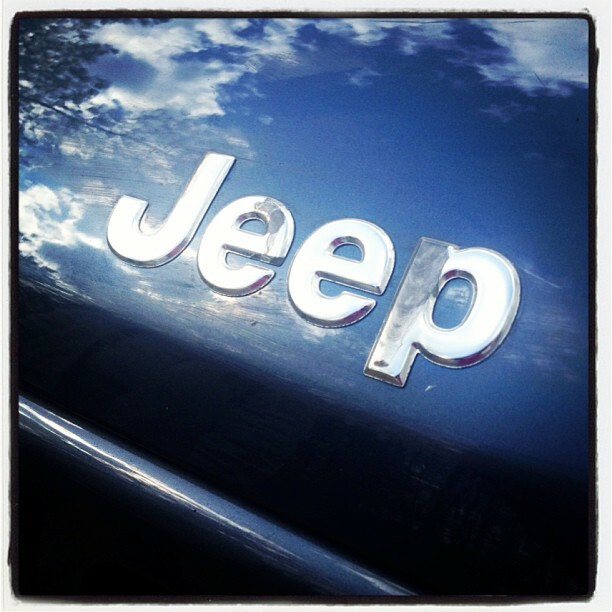 I’m starting to think it’s the safe way to go even though I love my Jeep. It was a rough start. 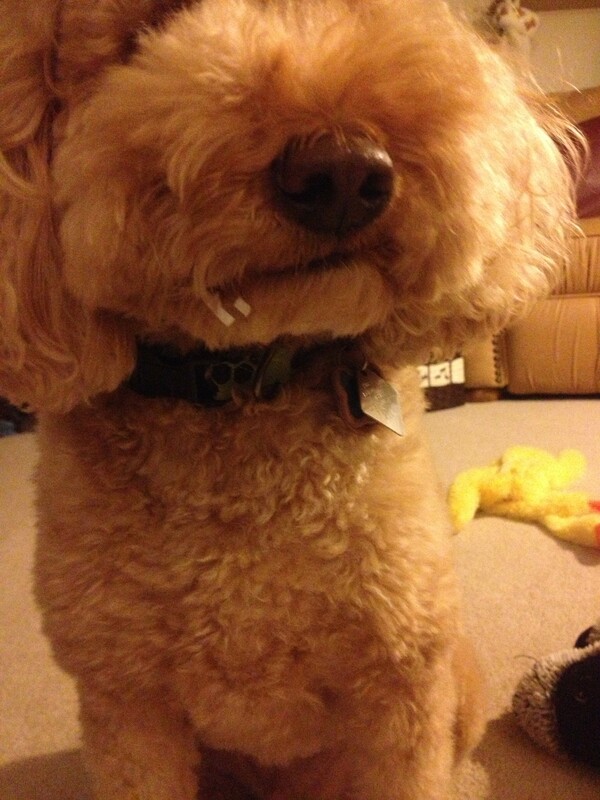 Duncan seemed to have a boo boo on his eyelid…I saw some dried blood on his fur and panicked. Luckily it looks like he’ll be just fine and we can avoid a vet visit. I’m NOT good with Duncan boo boos! Next up was the rain. It was pouring so hard AND the wind was whipping. I stood at the bus stop and battled my umbrella best I could but by the time the bus came my jeans were sopping wet from the knee down as were my feet:( Traffic was bad and I was over a half hour late to work. But my boss helped me find our little space heater in the office closet! I sat and dried out the sopping wet feet and jeans. Dear space heater: I love you! Within 30 minutes that debacle was a thing of the past. (Well my hair was tragic but when you have naturally curly hair you just learn to accept tragic hair on rainy days). Then I found out my friend’s dog crossed the rainbow bridge:( She was 15 and I guess we knew her time was near, but it’s never easy to say goodbye to a furry best friend. So my Monday was definitely starting off on the low end. A friend mentioned later in the day that today is actually called Blue Monday: the most depressing day of the year. I get it. The menu. Beer was kept cold in the snow on the back deck (genius!). There were also plenty of beverage options inside. Dinner was a petit filet steak for each person, broccoli, green beans, quinoa, sweet potatoes and jambalaya. The “Wrapped Crap” exchange: I received a “ZePad”. It was a $20 fake iPad that was actually purchased as a decoy for my friend’s daughter by her boyfriend so that he could eventually surprise her with the real iPad later on. They both knew I would get a kick out of it so they re-wrapped it and ensured that I was given that package. It’s actually like having a very old computer. It plugs in….even takes pictures. We tried to connect it to the internet but unsuccessful at the moment. I refuse to throw it out though. This is one wrapped crap gift I’ll be keeping even if it’s just to use the calculator function. LOL! There was also a bottle of French shower gel and in French it is Gel Douche. Yes we giggled like teenage boys. Other wrapped crap classics….a stinky candle, and some mismatched glass coasters and a gaudy holiday coffee mug. The conversations: I don’t get to see these girls often so it’s nice to talk about some funny stories of our past. One big topic of discussion was about signs we get from people who have died. Ladybugs, butterflies, feathers, coins, numbers, scents, songs, electronics going haywire. I think we were all in agreement that our loved ones continue to let us know they’re with us once they’ve passed on. The S’mores Dip: I did it again! I made a stellar dip. Actually I think my ratio of melted chocolate to toasted marshmallow was better this time around. beautiful, perfectly browned toasted marshmallows combined with the right balance of melted chocolate. I approve! I mentioned in this post that I’m getting ready to repaint all the rooms in my house. Well, I have been looking for new bedding for my bedroom. Today, I felt the need to cheer myself up so I finally pulled the trigger and ordered 2 different duvets and a decorative pillow. Here’s a little picture showing the purchases and also I tried to make a little representation of what the final product will look like. I’m painting my bedroom walls gray. My headboard is white and i’m planning on mixing the black and white toile duvet with the teal colored one…shams too. And then I got this cool petal covered pillow too. So that’s that. I’m off to bounce now. Have a great night. Question: Do you like your current bedroom bedding or do you feel the need for a change? What are your colors? I won’t dump because this blog isn’t about that. Let’s just say today was craptastic in the crappiest of crappy (we’re talking New York City Marathon 50,000 runners used a porta-potty crappy (That actually just made me giggle). And how dumb I felt tonight when I posted on Facebook about feeling defeated and I get words of encouragement from one friend who’s battling ovarian cancer and another who’d dad was shot and killed this year and found out today the gunman pleaded not guilty. Yeah, my crap isn’t really that crappy. When I came home from work, there was a package at my door. 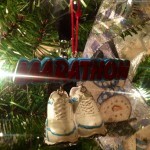 It was the running ornaments (I mentioned in this post) that I ordered for my tree. 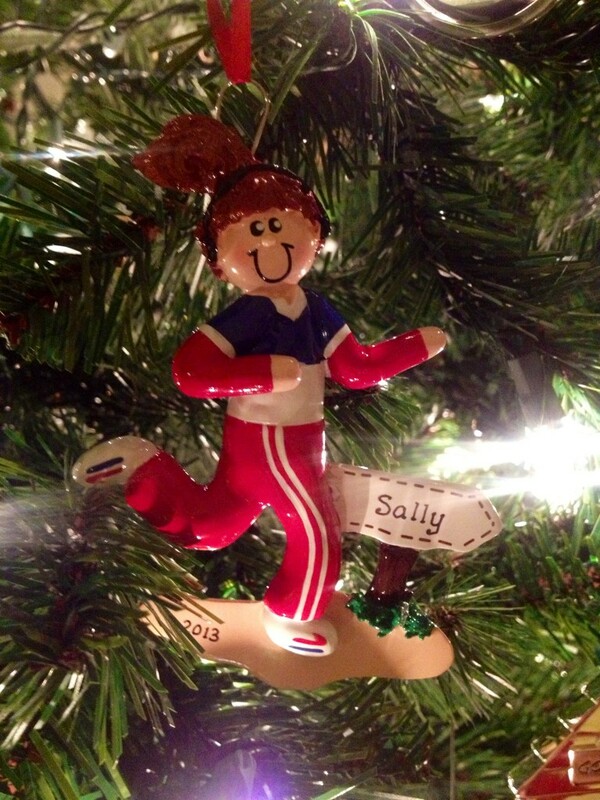 The sneakers are a little Richard Simmons looking but it’s a cute lil’ ornament. And it gets the point across no? This cracks me up. I’ll have to try and re-create the look one day. So there was the glimmer. 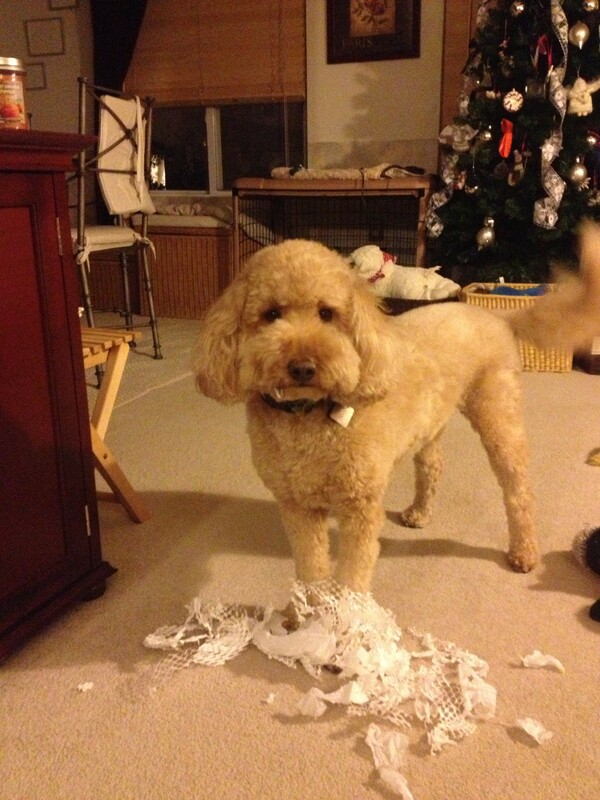 And I had a good laugh too watching Duncan shred the paper that the gifts were wrapped in. He even had a couple of pieces stuck to his mouth. He goes from playing in white stuff outside to playing with white stuff inside. I’m working on a new section for the blog for 2014 that will have a collection of “Running 101” type posts. I’ll give some tips for outdoor running topics like running surfaces, safety, how to dress for the weather, fueling tips, stretches to help common runner ailments and other things like that. If you have any suggestions for topics you’d like me to feature just leave in the comments below. I’m also planning on a section that will be filled with inspirational mantras for both running and life in general. And I’ll be updating my races page as I’ve already got a handful of 2014 races on the agenda. Well it’s after midnight….I better catch a few winks. Night all! Bring on the Rain is a song by Jo Dee Messina. Have you ever heard it? It’s a song I always play when I’ve had one of those “small stuff” days. Today started off with a 5am wake up so I could drop my beloved, ahem, 11 year old Jeep to the mechanic by 7am. I had been hearing some rattling. Also, the rear swing door wouldn’t open and I had a recall to be completed as well. I caught a bus from there to work and was at my desk at 8:15 (well over an hour early!). Midday, I got the call from the mechanic with the bad news. It would be a few thousand dollars to repair. From leaking power steering lines and batteries to broken pieces of my exhaust, a serpentine belt and tension rod that needed replacement, and heck, even a stripped lug nut. Oh and the work wouldn’t be done until the next day. Now, I know damn well that life can throw you true curve balls. I watched my husband die as I held his hand when I was just 25. Yes, that’s the stuff that is supposed to make you feel slammed and pounded. But I tend to get rattled (just like my exhaust) with the small stuff. The things that break my routine or cause me to worry about the future. That’s why I firmly believe running is my therapy. It’s one of the only (healthy) ways for me to cope with the small stuff. 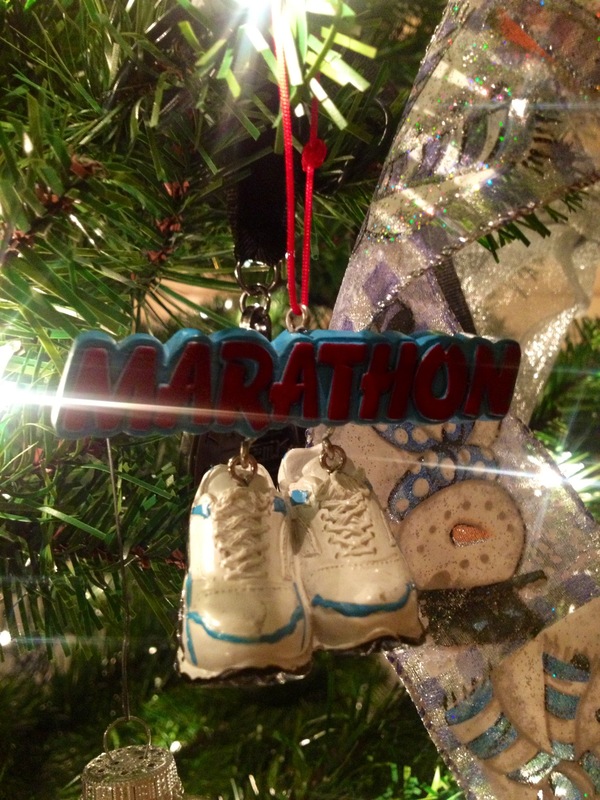 Of course my timing sucked with this one since I just ran my final race of the year on Saturday….I didn’t run today. I won’t be running for at least another week while I try and rest my hamstrain ( get it? hamstring pain….hamstrain…I should trademark that!). 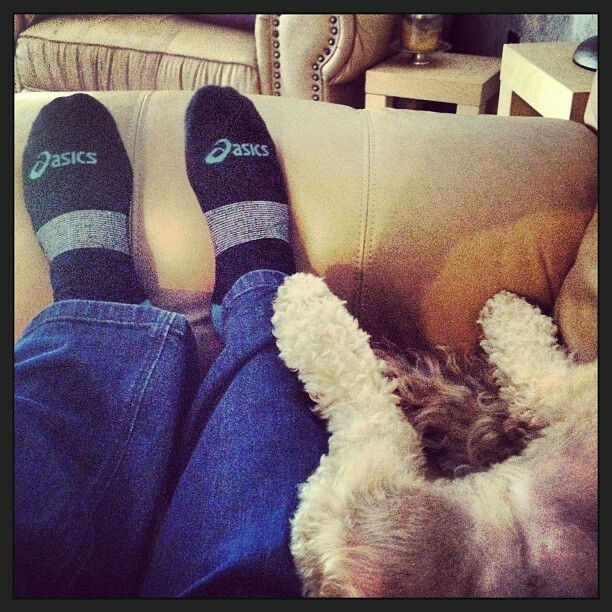 So I’ll just try and keep my mindset in recovery mode and sit on the couch with my dog…. Now if nothing else could get me to check myself, It’s Veteran’s Day today. I’m so in awe of those who have served (and are currently serving) our country. And it’s also apparently almost Christmas. I saw Santa at the mall yesterday. Not cool! And those lame commercials are starting to appear. Question: How do you cope with unexpected “small stuff”? 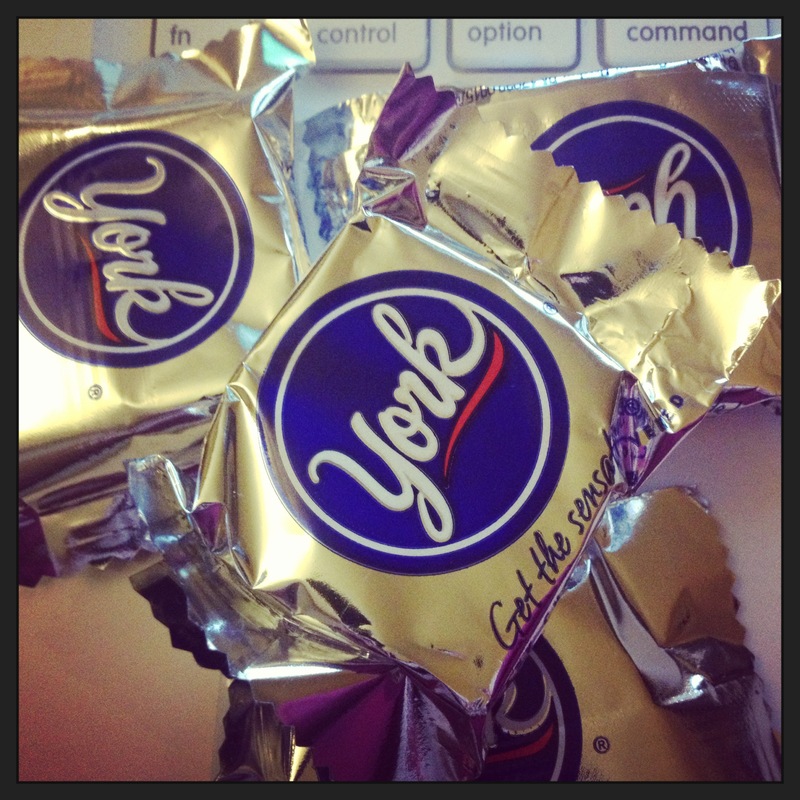 What’s your favorite coping candy?